The visually spectacular 18 hole golf course at Aphrodite Hills was designed by Cabell B Robinson and opened in 2002. The full course is 6,289 meters and due to the distances between some of the holes a buggy is required, although the back 9 holes can be played on foot at certain times. The Bermuda grass fairways and tiered greens spread over two stunningly beautiful plateaux divided by a 130 meter gorge and have outstanding views from virtually every aspect. As well as a separate 3-hole academy, the golf club comprises a double-ended driving range and a short game area with pitching and chipping greens. For the fashion conscious the pro shop has an extensive range of clothing and equipment to satisfy the most discerning golfers. The clubhouse overlooking the 18th hole is open to the public during the day, serving food and drinks throughout. A very popular wedding party venue, the clubhouse also offers a superb Sunday buffet lunch prepared and served by an excellent team. Nestled along the valley floor just west of Petra Tou Romiou, amid natural landscaping and mature planting the ‘Secret Valley’ golf course is one of the Islands hidden gems. The course to which Tony Jacklin has given his signature was designed by Iacovos Iacovou and is one of the Islands most challenging courses. Originally opened to the public in 1996, the 18 hole course is 6,690 yards and a par 72. It has very recently been completely redesigned and refurbished. Laid out on relatively flat terrain and surrounded by steep valley walls. As well as the course itself, there is a 300 meter driving range, 3 full size practice greens, 2 full size bunkers and a golf simulator. The large clubhouse is a welcoming venue for golfers and non golfers alike with glorious views and offering a full and extensive menu throughout the day. Included within the clubhouse area is the golf academy, the fully stocked pro-shop, and the hire department for buggies and equipment. 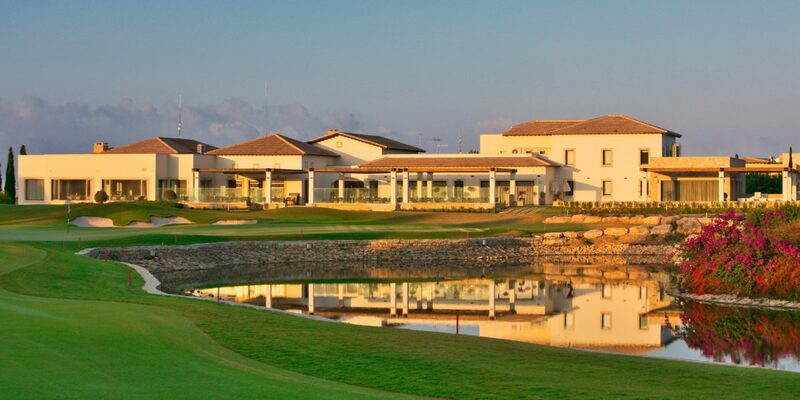 Situated just a few kilometers east of Paphos town, Elea Golf course is one of the newest golf courses in the Paphos Region, opening its doors in 2010 amid much fanfare. The par 71, 18 hole course was designed by the legendary golfer Sir Nick Faldo and the 18 holes wind amid carob and olive trees from the Clubhouse at the top of the hill down towards the sea. The course, which is commonly thought of as very enjoyable although quite tricky, is laid out over 6,900 yards with water hazards, rocky outcrops and an abundance of bunkers to catch the unwary. The elegant clubhouse, which features several la rge terraces overlooking the sea, was designed by Hart Howerton. It has good facilities including a members area, pro shop and an extremely good restaurant. The beautifully appointed restaurant, which has a wide, shaded terrace with Mediterranean and sunset views is open to the public serving meals and beverages all day and is a popular venue for events of all kinds. Located on the quiet hillsides 15km north east of Paphos and 550 meters above sea level, Minthis Hills Golf Course has a reputation of being a course to be reckoned with. Founded in 1994 on the grounds of a 12th century monastery it was reopened in 2007, following a thorough make over at both the course and the clubhouse. The surrounding land is mainly agricultural with vines, oli ve groves and wheat fields as far as the eye can see. The 5,843m championship course, which is open throughout the year, was originally designed by Donald Steele and renovated by MacKenzie and Ebert and is a par 71. The fairways loop around mature trees and water features, with narrow tree-lined fairways giving the player plenty to think about with careful assessment required in every shot. The sumptuous clubhouse which offers an extensive menu and wine list, is a favorite destination for diners from all over the area who come to absorb the relaxing and tranquil atmosphere of this delightful location.